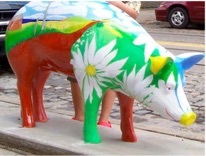 I was sponsored by Recycle Bank to paint a lifesize pig sculpture in 2006, my pig “Daisy” was auctioned off to benefit the Chestnut Hill Community Fund, the Preservation and Beautification of the Chestnut Hill District and the Philadelphia Zoo. 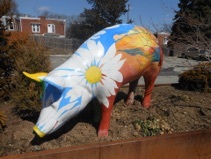 A local lawyer, Marilyn Monaco purchased Daisy and gave her to the Chestnut Hill Hotel to display at the nearby Farmer’s Market . After a recent renovation project, Daisy appeared on the roof. 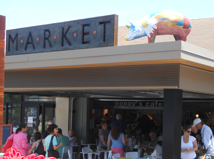 Now I know that pigs really can fly with the help of art sponsors!